Year 2018 Starts with Increased Volatility? You are here: Home / Futures and Options / Year 2018 Starts with Increased Volatility? IndiaVIX is a volatility measure of the future expected volatility. It is calculated based on the bid and ask price of the out of the money options for near month and mid month options. India VIX during the year 2017 spent most of the time below 14 which eventually turns out to be a slow moving trending markets. In fact during the entire year 2017 , Nifty never seen a 2% negative loss on EOD basis. That shows the confidence of the majority of the market participants. During the Year 2017 volatility spiked twice due to UP Elections and Gujarat Elections results expectations from the market participants. Future implied volatility spikes up not only because of there is fear on the street but also when there is an upcoming major planned global or local political events. Especially where there are binary events like BRExit, Election Results..etc where the outcome is binary and unpredicatable, long term players gets into hedge mode and markets will be completely dominated by speculators make the implied volatility to spike and the volatility tend to crush just before the event or after the event results are out. 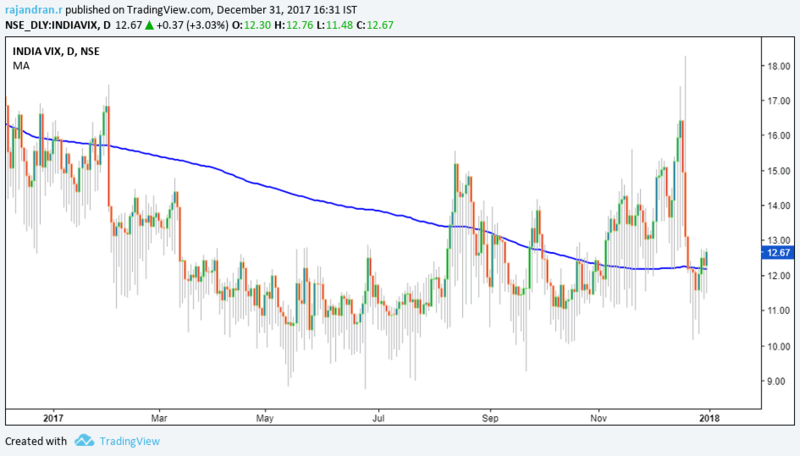 Currently India-VIX self sustaining above 200 moving average. More it sustains above 12.18 levels higher the possibilities of increased volatility. 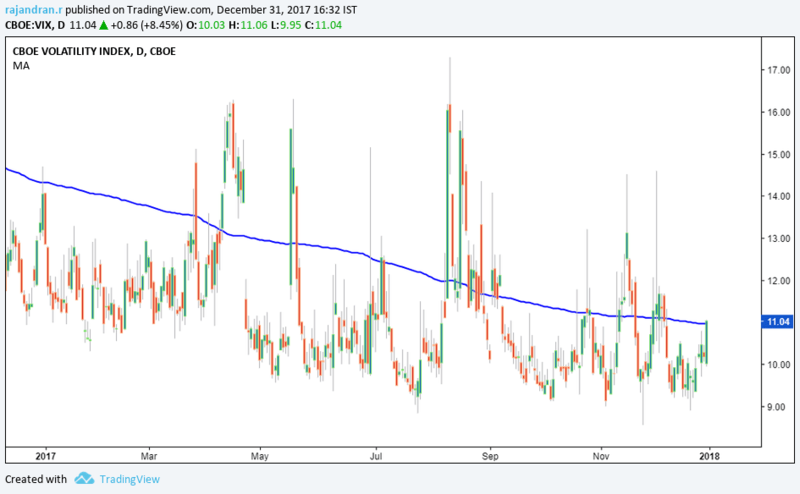 In the year CBOE (Mr Robert Whaley) started publishing VIX in realtime for S&P 500 which is calculated based on the bid and ask quotes on the implied volatility of the calculated S&P 500 index options. During the Year 2017 most of the time CBOE VIX spend below 13 and even tested historically low volatile levels. Current VIX reading is at 11.04 up by 8.45% on last friday which makes the CBOE VIX to stay above 200 moving average. May be its time to start giving attention to volatility as period of low volatility is followed up by period of high volatility and the global markets are likely to flare up with increased volatility in the start of 2018. Short Update on India VIX and Open Interest During the entire month of august and September(till date) India VIX value remains below 18 signifying that there are high chances of continuation of compressed/sideways market.